Download our awesome new app now and stay up to date with all the latest information! 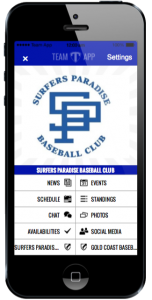 Install the Surfers Paradise Baseball Club App on your smartphone or tablet now! Follow the below steps to download our app. Signup to Team App.You will be sent an email to confirm your registration. Login to the App and search for “Surfers Paradise Baseball Club”. Choose your applicable access group(s). What if you don’t have a Smartphone? No worries, go to surfersparadisebaseballclub.teamapp.com to signup and view this app in your web browser.